The number of adults in the United States who indicate they have no religious preference is rising dramatically. The chart at the right shows that the number of U.S. adults with no religious preference grew from 8.2 percent in 1990 to 15 percent in 2008. The most striking increase occurred in the decade of the 90s. 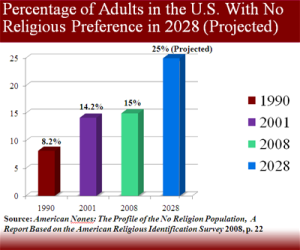 Barry A. Kosmin and Ariela Keysar, the principal authors of the American Religious Identification Survey in 2008, project that in 20 years – or in 2028 – the number of adults with no religious preference will increase to 25% of the of the U.S. population, as shown in the chart on the left. A 2010 study by the Pew Forum on Religion and Public Life found that Americans ages 18 to 29 have already surpassed Kosmin and Keysar’s prediction. Twenty-six percent of these Millennials say they are not affiliated with any religion, be it Protestant, Catholic, Jewish, or some other religion, as the chart on the right indicates. While the number of U.S. adults with no religious preference or affiliation is increasing, the number of adults choosing to become Catholic in the past decade has decreased. 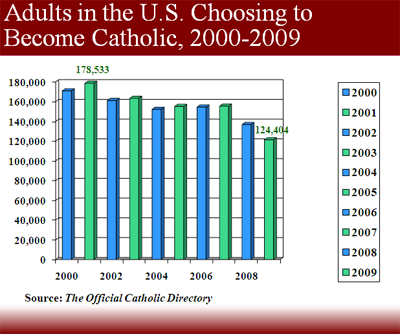 The chart on the leftshows that since the year 2000, the largest number of adults; 178,533; became Catholics in 2001, either through baptism or by making a profession of faith. That number decreased to 124,404 in 2009, a decline of 30 percent. What implications do these trends have for Catholic evangelization? Four considerations are listed below. 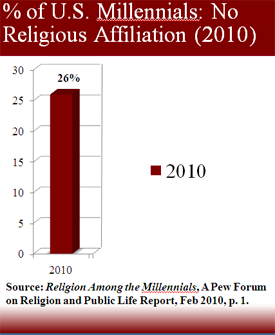 Our secular culture does make an impact on the religious preference of adults, especially young adults. The number of adults saying they have no religious preference will continue to increase. 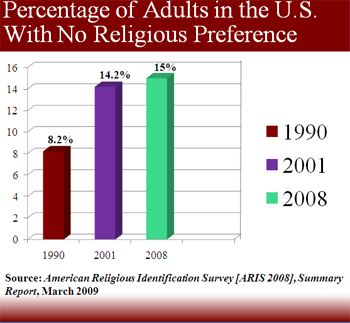 Many who are unaffiliated or have no religious preference are seeking faith. Some feel their religious needs are not being met. When they find a religion they like and that meets their needs, they will become members. Catholics need to be more proactive and intentional in their efforts to invite and welcome those with no church family. Jesus said to Simon Peter, “Put out into deep water and lower your nets for a catch” (Luke 5:4). A parish that is attentive to the needs of seekers and that responds to those needs through personal relationships, letters of invitation, and appeals through newspapers and their parish website, will have a greater chance of connecting with the unchurched when they are seeking and open to an invitation. The Holy Spirit provides the inspiration and power to propel parish evangelizing ministries. Pope Paul VI’s reflection on the Holy Spirit remains as insightful and true today as when he wrote these words in 1975: “It must be said that the Holy Spirit is the principal agent of evangelization: it is he who impels each individual to proclaim the Gospel, and it is he who in the depths of consciences causes the word of salvation to be accepted and understood” (On Evangelization in the Modern World, no. 75). Coming to know the love of Christ as a Catholic can enrich the lives of seekers enormously, offering them joy, peace, purpose, and hope. With the dramatic increase in the number of U.S. adults with no religious affiliation, Catholics today have a great challenge and a timely opportunity to share the Gospel. Fr. Kenneth Boyack, CSP, is Vice President of the Paulist National Catholic Evangelization Association.